Drawn in a timeless Scandinavian style, this mid-century Swedish Kilim has a structured minimalist composition accented by understated geometric decorations. 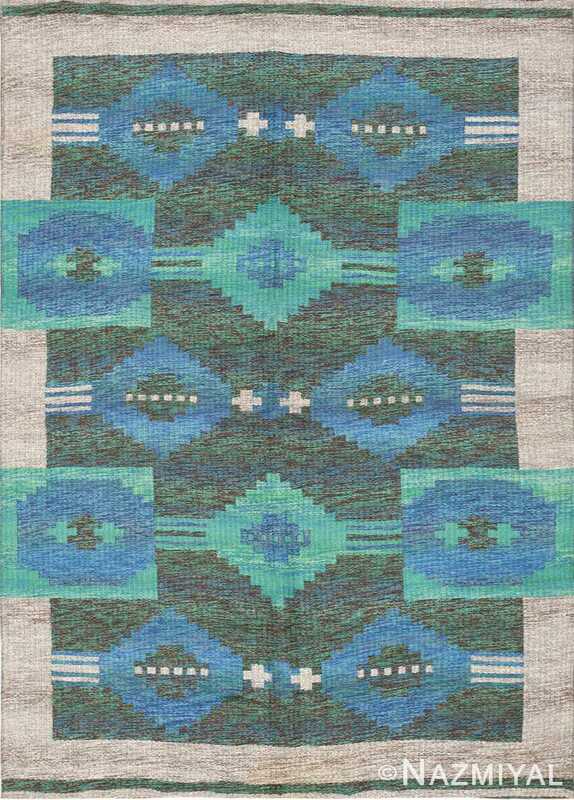 Vintage Swedish Rug, Country of Origin: Sweden, Circa date: Mid 20th Century – This chic vintage rug is an artisanal Scandinavian textile for the ages. The timeless tiled field features a handsome variegated background that incorporates low-contrast gray and ecru shading. 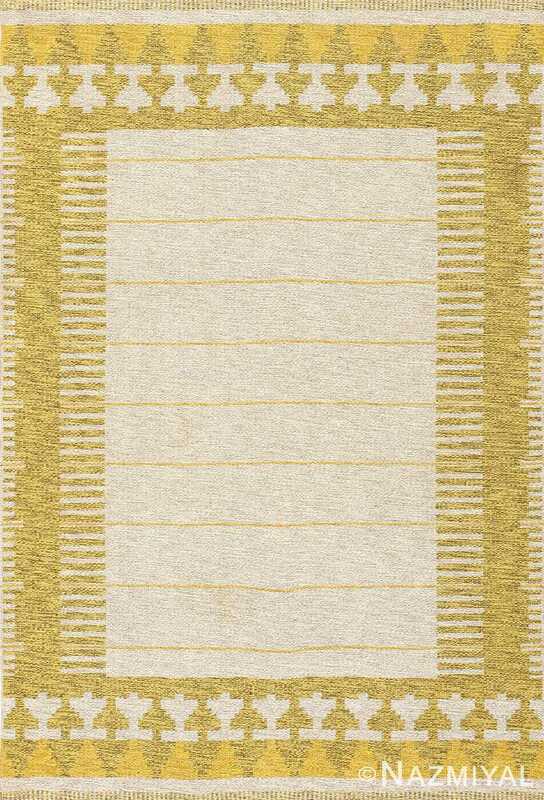 Chic woven textures, heather gray accents and decorative motifs woven in a countrified combination of bluestone and maize yellow give this vintage Swedish rug a luxurious handcrafted appearance. Decorative hash-mark dividers and concise lozenge spangles define the structured minimalist composition and integrated borders. 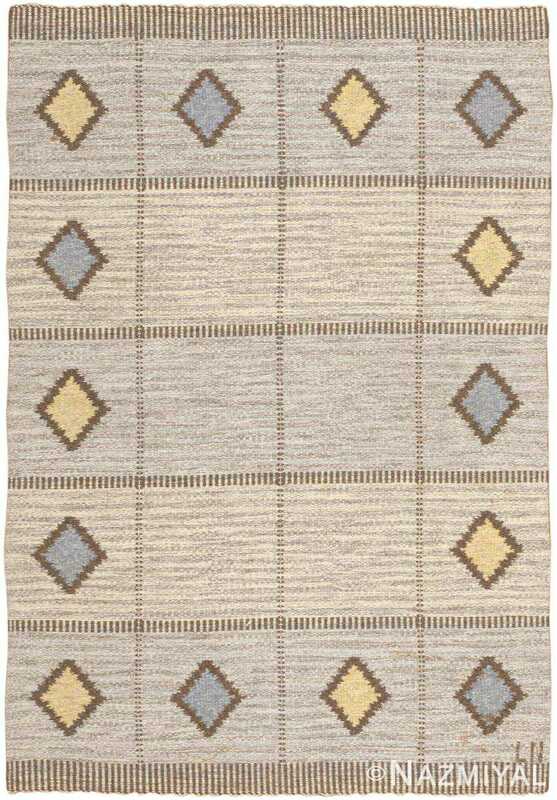 This exceptional mid-century rug has a quaint cottage style with streamlined geometric figures and strong minimalist details that are effortlessly elegant. Formal structured elements and rustic woven subtleties are carefully balanced in a manner that represents the warm, comforting style of Scandinavia. 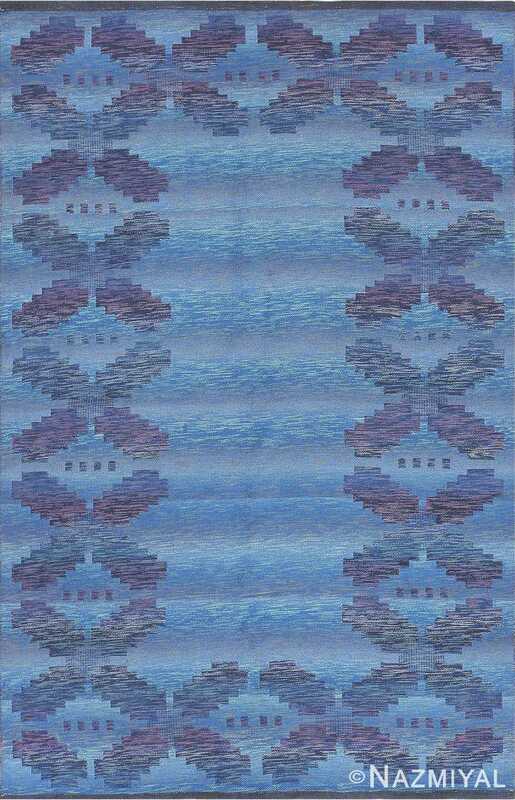 This comely vintage rug from Sweden boasts two sides of beautiful blue, bordered by a charming geometric border. Chic tiles and geometric lozenges form a stunning repeating pattern that is rendered in an elegant selection of cool gem tones and executed in a reversible manner.